In the world of retail, conventional wisdom has always said “more is better”, especially when it comes to choices. Offering a customer the ability to choose from more and more products is the right way to grow… isn’t it? It turns out research is finding that presenting more options (however well intentioned) may actually lead to a decline in sales rather than an increase. This phenomenon is referred to as “choice paralysis”. “On one day, shoppers at an upscale food market saw a display table with 24 varieties of gourmet jam. Those who sampled the spreads received a coupon for $1 off any jam. On another day, shoppers saw a similar table, except that only six varieties of the jam were on display. The large display attracted more interest than the small one. So, having a wider variety may get more attention, but a more discriminating, well-curated inventory may actually lead to increased sales figures. To be clear, variety is important. But it’s like anything else, it can go too far. The balance here depends on your industry, your brand, your customer base, your square footage, or any number of other considerations. Just be careful to “funnel” your customers in the right direction. The way to do this in a retail setting is by having clear grouping. For example, a shoe store usually carries multiple different styles of shoe from multiple different brands and each product comes in different colors and sizes. Consider which is most important to the customer and group accordingly. In this case, rather than grouping by brand, it may be best to group by style. So, for instance all the stiletto options would sit on a single shelf. It’s most obvious to put the different styles all together on a row, left-to-right with the lowest to the highest prices. If more than one brand makes a stiletto, then they’re side-by-side. This way, a client who knows they want to buy a pair of stilettos can have their choices made more obvious and less overwhelming. That same thinking can be applied to any number of products where choice paralysis can become a concern. 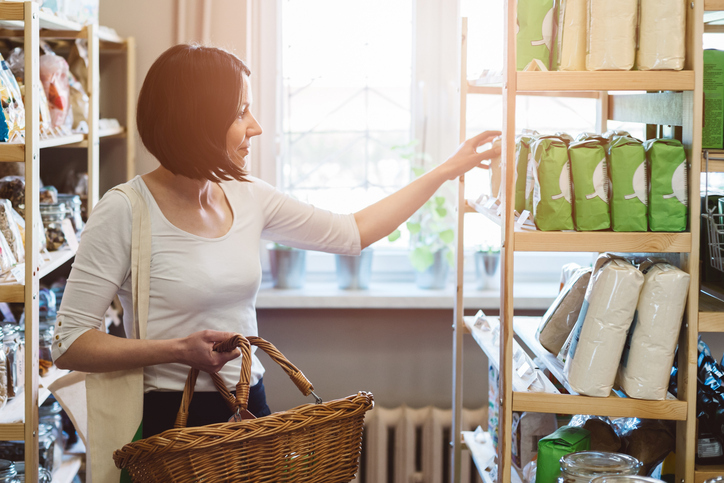 Smaller merchants simply can’t afford to waste shelf space. If an item is selling strong, great! If an item is gathering dust, it’s not paying its share of the rent. Take a look at what’s around it. Is it camouflaged a forest of similar alternatives? When stocking, there should always be clear differences. Usually, this comes in terms of price, but it can also be in differences between the two products. For instance, if I own a small food store, it may not make sense to have a lot of different options for bread, but that doesn’t mean I can’t have variety. I can have a cheap white bread option for price-conscious customers, a more expensive gluten-free option to accommodate the current trends in gluten sensitivity, and a whole-grain option in between for shoppers who prefer an alternative to the white bread, but don’t want to go as far as gluten-free. There are clear, obvious differences, and that’s what is most important. Like anything, there’s balance here, though. It often does pay to take risks by trying out new products, as we’ve mentioned in previous blogs. All we’re saying is, “make it easy for your customers”. As a merchant, it can be difficult not to lose the forest for the trees. You’re attuned to the industry. You have discussions with suppliers. Your inventory is the lifeblood of your business so you’re intimately familiar with your product in a way your customers most likely aren’t. Bear that in mind when building your shelf displays. Every merchant loves it when a customer finds what they came in looking for, but no one wants a customer walking out of their store feeling like they made a bad decision. Take a look at the choices you’re offering your customers and ask yourself a few questions. What’s the difference here? Could this shelf space be put to better use? What do I look for when I’m in someone else’s store? In software, there is a guiding principle that says, “don’t make me think”. It just means that any webpage or product you design should be obvious in how it works. Your users should be able to move with confidence and make simple decisions easily rather than having to look at a giant list of options. You can also help your customers make confident decisions by simply reducing the number of choices and streamlining the buying process. To help you analyze your inventory, we at Shopventory have a suite of reporting tools for businesses of every size to make your choices easier as well! Not only that, but our tools are free to try and plans start as low as 79¢ per day. Right now, you can sign up for a 30-day full-featured free trial of Shopventory with no credit card required. We also back Shopventory with a 30-day money back guarantee. That means a total of 60 days risk-free!